That’s what I’ve got so far. It’s a simple and modern pattern from Amy Ellis in her book Modern Basics II. This one comprises of two different types of blocks, the one on the right and I’m currently making strip sets that will also be cut down into individual blocks. I may have to do more cutting of the Cotton and Steel fabrics, as I’m adding another row to the original design. The gray fabric is a Kona Solid – I believe the color is Ash. I’ve already decided to quilt it with wavy, loose horizontal serpentine lines. Sewing long straight stitches on my Brother machine is difficult, and I never feel like it looks “professional.” The good news is that using the wavy stitch really hides that! 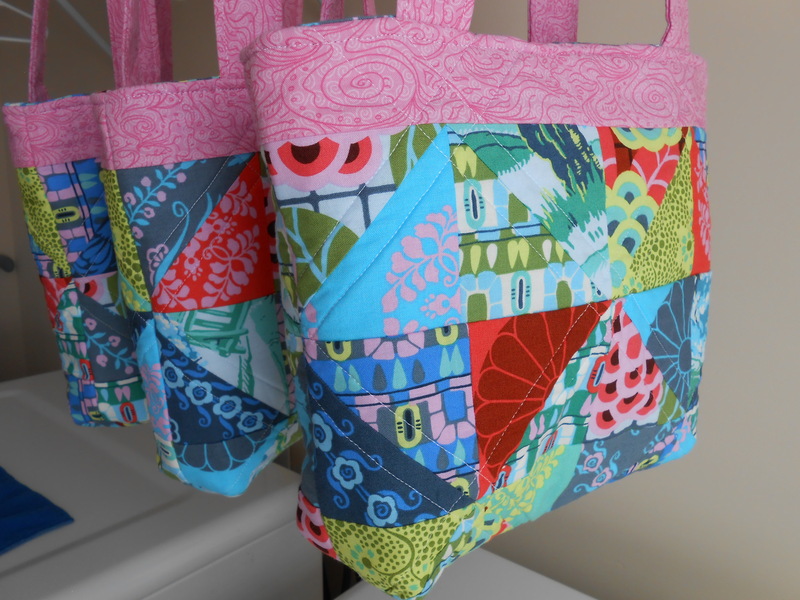 After finishing these three quilted tote bags for a friend, I gently laundered them and pressed the handles. These were made using Amy Butler fabric in the Cameo fat quarter bundle. Since the colors were a bit intense and darker than I expected, I wanted to lighten up the palette with bubblegum pink print fabric from my local quilt shop. Sometime I do need to finish this patchwork baby bib I started making from scraps. 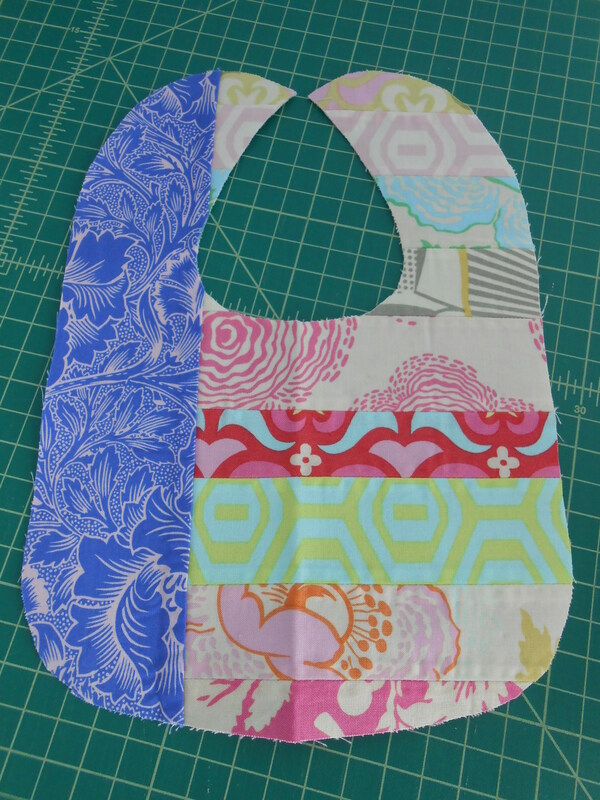 I found this cute tutorial from Clover & Violet and cut out the pattern and interfaced the back for stability. I’ve been backing bibs with soft leftover cuddle minky from another project and adding snaps instead of Velcro. What are you working on? Feel free to share in the comments! 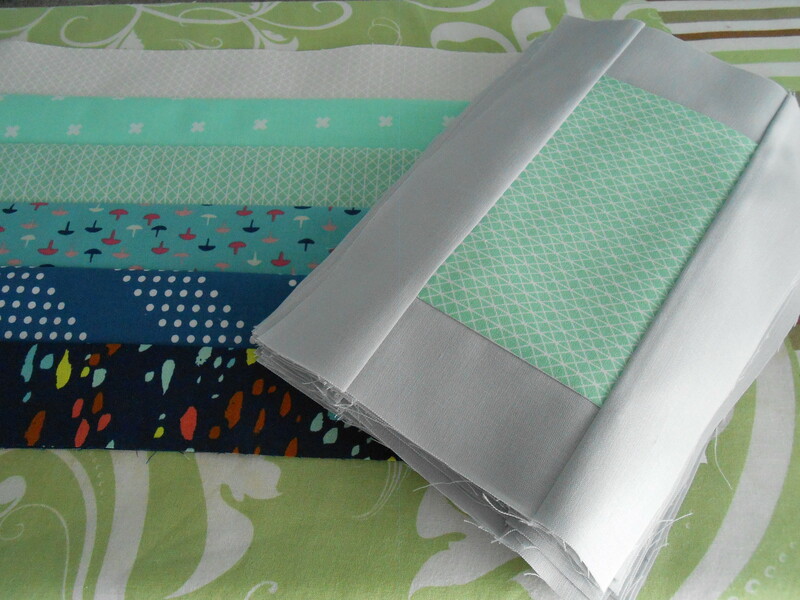 2 Responses to "WIP Wednesday: New modern quilt"
Isn’t it nice to be back to a quilt? More and more I prefer flat projects. Your tote bags turned out very well. Thanks Valerie! I agree – there’s just something about finishing a real quilt that gives a sense of huge accomplishment!